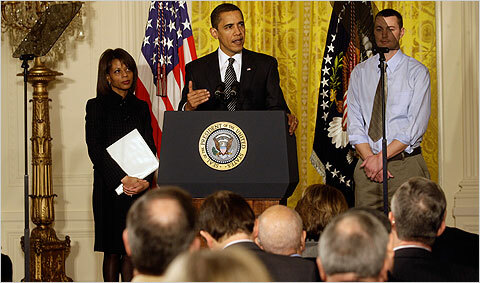 Doug Mills/The New York Times President Obama spoke at a White House conference on health care. President Obama said on Thursday that though “special interests” and “industry lobbying” had blocked improvements in the health care system for decades, he vowed to end the stalemate this year and ensure that all Americans have access to affordable health care. “Those who seek to block any reform at any cost will not prevail this time around,” Mr. Obama said in opening a White House conference, where he promised to reduce health costs and expand coverage. The conference is drawing more than 150 participants, including members of Congress and leaders of labor unions, business groups, doctors, hospitals, insurance companies and consumer organizations. Robert Pear has more on the conference here. The White House is carrying live video of the forum’s various sessions today. You can follow the action here.